From A to Z, fifty great science fiction themes are brought to live in short stories by the masters. Alien worlds, bionic persons, computers, extraterrestrials, hyperspace, invasion of Earth, mad scientists, other dimensions, robots, time travel—these are the subjects of timeless tales from authors old and new: Brian Aldiss, Isaac Asimov, Ray Bradbury, Arthur C. Clarke, Gordon R. Dickson, Fritz Leiber, Anne McCaffrey, André Norton, Alexi Panshin, Cordwainer Smith, H. G. Wells, Roger Zelazny, and many others from the science fiction pantheon. The stellar anthologists Asimov, Greenberg, and Waugh have pooled their profound knowledge of the field to put together a super collection that shows the many dimensions of science fiction. But this is not just another collection of the “great old stories.” Most of the tales collected here have rarely been seen since their first publication. Librarians will welcome the opportunity to base their long-term science fiction collection on this wide-ranging work. Schools and colleges will find this fresh new anthology meets many needs. And fans will relish a new treasure trove—more than seven hundred pages of their favorite subjects by their favorite authors. An indispensable book for any and all readers of science fiction and sure to become a classic in its field. This is actually a fairly nice anthology. 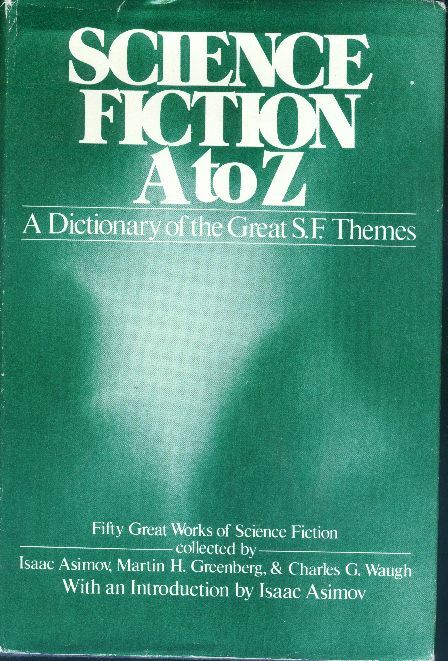 Of course, it has its particulr schtick, in this case being a listing of major “themes” of science fiction (at least one per letter of the alphabet) and a story illustrating the theme. Asimov himself is represented this time, by “Robbie” (not a bad choice for the theme of "robots"). The other stories are generally very solid, even if not the quitessential story for the theme in question. Some are old friends from other Asimov/Greenberg joint anthologies, and some not.